Hello lovelies! Today's post is bursting with gorgeous shimmery goodness! When BLUSH Lacquers released the Beachside Sunset collection I fell in love and knew I needed all of them. Let me tell you, I was not disappointed! 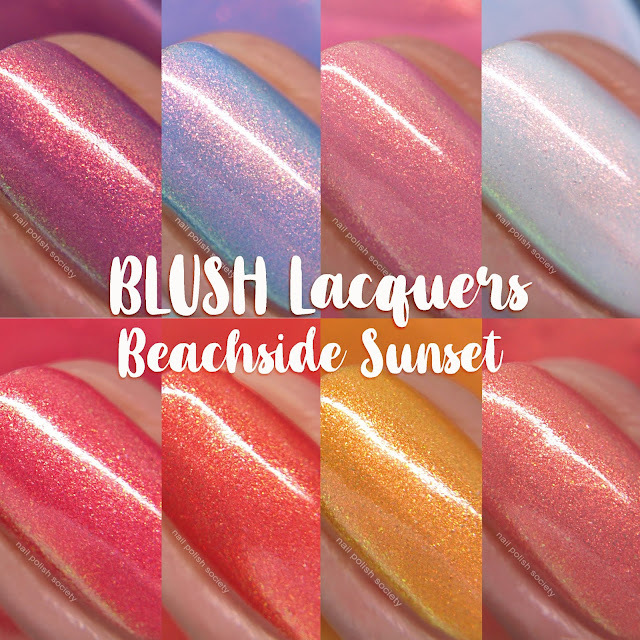 The collection consists eight sunset and beach inspired shades with strong shimmer and subtle shifts. The formulas are consistent and easy to work with. I also love the large flat and rounded brush that makes application extra easy. Are you ready to check out what is probably my favorite collection of the year? Hello Society Sisters! The lovely Carolina of Colores de Carol has created a beautiful six piece camping-themed Fall collection. Even though I haven't done much camping as an adult, I have fond memories of all the times I did during my childhood. So the theme holds a lot of nostalgia for me. I always look forward to Carolina's Fall collections and this one did not disappoint. She has a knack for creating a lot of variety in finishes and the formulas were all wonderful. Let's take a look..
Hello my polished peeps! 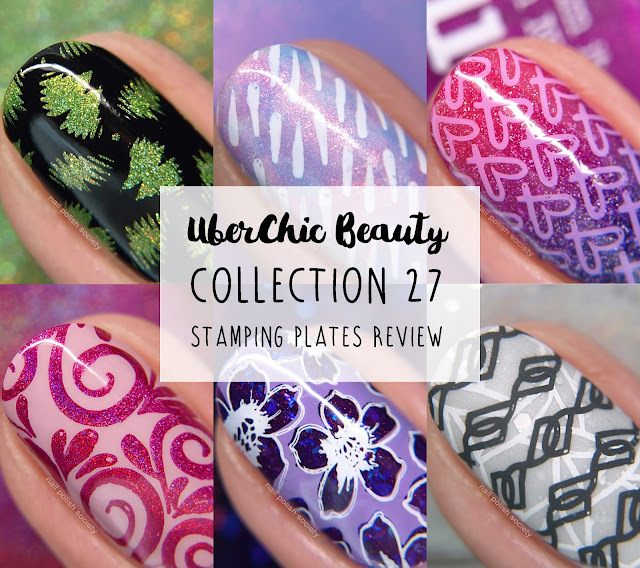 It's been a minute since I've reviewed new UberChic Beauty products. They've released a number of plates and more since I took a little break so I am working towards catching up with everything. I'm starting off with the three plate Collection 27 where I found a good number of images that I was really drawn toward. Let's take a look..
Hello friends! Fall is creeping up on us- my kids go back to school next week- and The Holo Hookup is ready for the transition with their September "Ch-Ch-Changes" box. 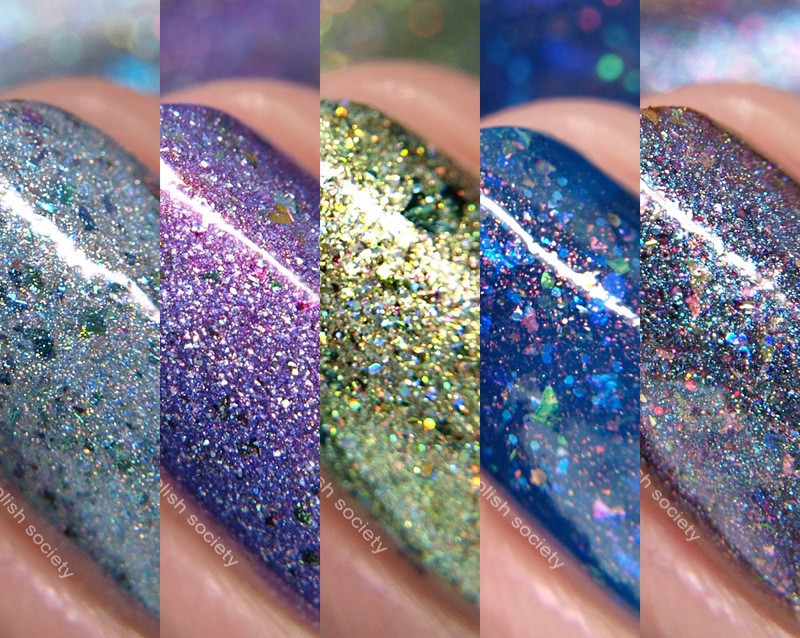 This month in addition to the three permanent indie brands- Cupcake Polish, Different Dimension, and Glisten & Glow- we have guest brand Spell Polish! Hello ladies! Although you may have already seen my swatches on Instagram, I am getting behind on my blog posts. Little baby doesn't want to nap more than 20 minutes at a time and my hands are full most of the day. 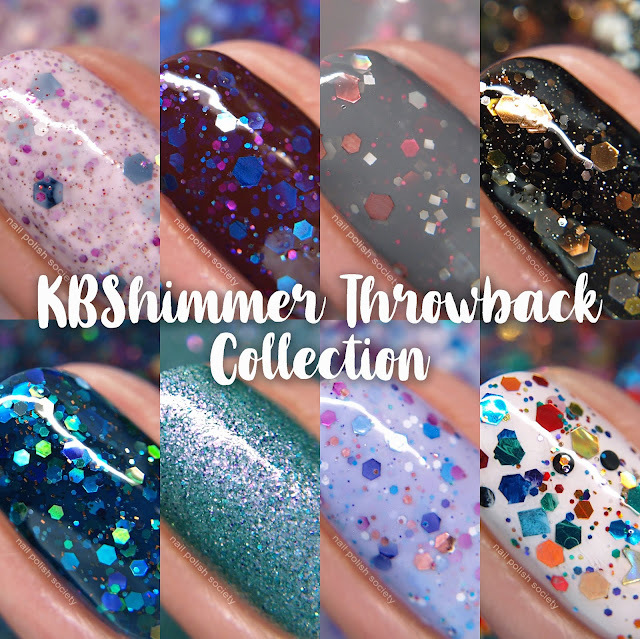 So finally here are some more gorgeous polishes from Girly Bits shades as well as two Girly Bits store exclusives from Rogue Lacquer! Hey there! I have two stunning limited edition shades to share! Normally the Girly Bits Color of the Month shades are only available during their calendar month, but since these were released late in July, they will available until the end of August! Let's take a look..
Hello friends! 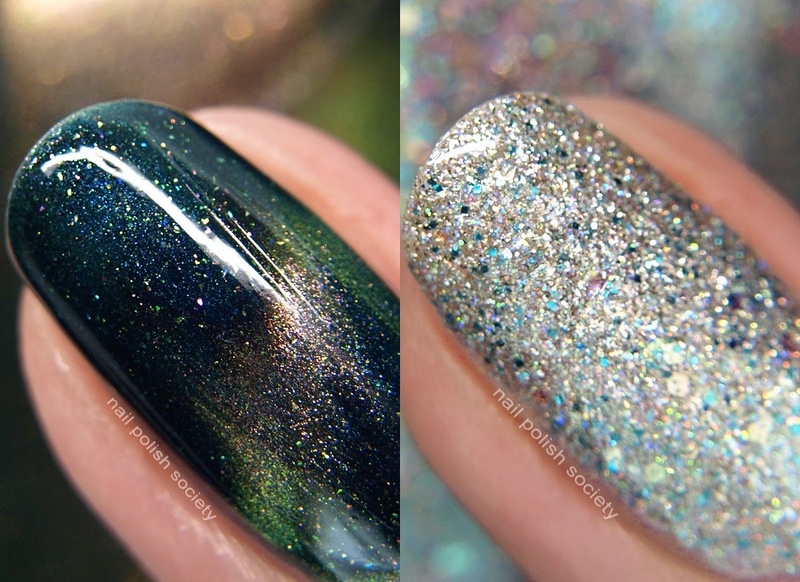 I have three gorgeous polishes from Painted Polish to share with you today! Painted Polish is celebrating 5 years in business- yay! To celebrate Lexi created a beautiful green duo that includes a stamping polish that is as perfect as I expected. The third polish is for this month's Polish Pickup. The theme for the August Polish Pickup is musicals and this shade was created with the original ‘Mamma Mia!’ movie musical as inspiration!